My mum plays a very big role in my life..huge!I wouldn’t be as gung-ho as I’m now if it wasn’t for her. Even up til now,she’s still as independent and brave as ever .I still remember that when I was a little girl,back then my mum was still working at the legal firm but she would wake up early in the morning & make me this lunch box thing. It consists of 4 small tupperwares filled with baked beans, sausages, green peas, fries or nuggets with ketchup on the side all zipped up inside a lunch box. It was the cutest thing ever and I still remember it until today.My mum is waaaaaaaaaaaay patient, calm, positive, polite and refined than I’ll ever be. I’ll be lucky if I can be as half as a good person that she is. :).Mama,thanks for everything that you've done & given to me.You'll always be the best mama in the world to me,Haziq,Syafiq & Raffiq!! So I baked a beautiful red velvet cake for Mother’s Day for my mum. 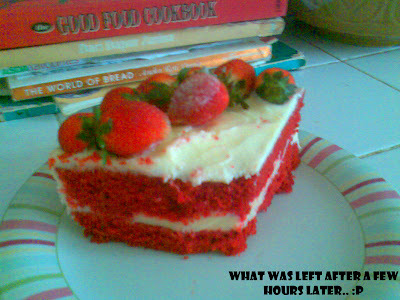 It was my first time baking a red velvet cake & it turned out well! !But as the comments at the post blog at Pinch My Salt that posted the recipe,the cake tend to spread many red crumbs when you want to ice it(as in frosting/icing it). But I was like,who cares with a few red crumbs here & there...hehe.The cake turned out very moist & since buttermilk is hard to come by in Malaysia,I substitute it for SunGlo Low Fat Yogurt because I search on the net that buttermilk can be substituted for it. 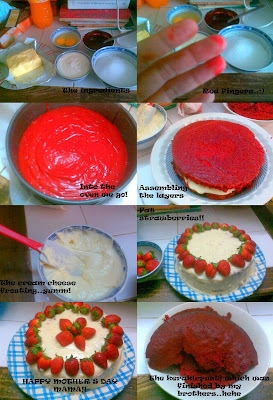 Here’s pictures of the process of me baking the cake.You can decorate it anyway you want but I chose fresh strawberries because my mum loves em’. The cake was very moist!My 3 brother’s even ate the ‘crust’(the part of the cake that you cut before putting on the frosting) of the cake.My very picky youngest brother Raffiq(who diet consist of croissants,pizza,choki2 & junk food—he doesn’t like rice+lauk) actually love my cake!!! My mum said that the frosting was a little too sweet..I guess it’s because I used only 1 package of cream cheese instead of the 2 package that the recipe asked but it was still A LOT of cream cheese.Click HERE for the recipe. 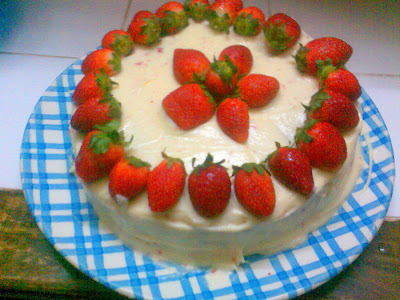 But nonetheless, I’m glad that I manage to bake the cake that I’ve been dying to bake. The taste of the cake is different than any cake I’ve tasted...I guess that’s why it’s so popular in the states & it appears in a lot of celeb’s wedding(Ellen Degeneres & Portia choose red velvet as their wedding cake! ).